This room is so bright and cheerful. 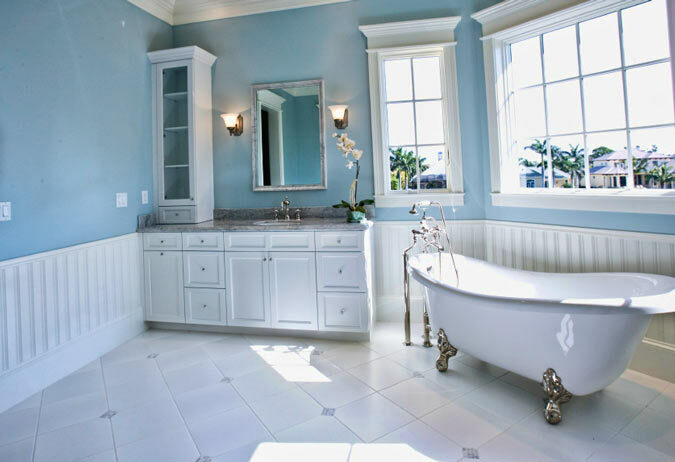 The sky blue paint goes perfectly with the bright white moldings and cabinetry. The wainscoting adds further charm to the room and serves as a stylish backsplash for the tub. Being an admirer of claw foot bathtubs, I immediately fell in love with this one and its silver feet. The hardware for the tub and sink matches perfectly with the grey countertop and pewter framed mirror. When the right colors and elements are brought together, simplicity is at its best. A crown molding similar to the CM-5011 was used for the ceiling. The window headers were created using a molding similiar to the BB-9789. Using a crown molding as a window header adds character to this room, and it suits the picturesque view. 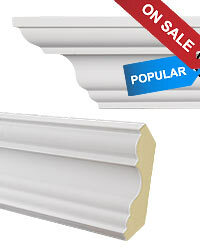 The trim used on the left and right sides of these windows is similar to the ET-8742. Window trim can also make a big impact in a smaller room such as this. 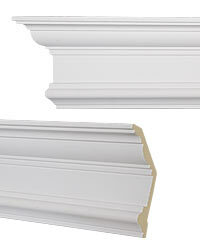 A simple baseboard similar to the ET-8901 was used in addition to bead board for the wainscot, which can be found at Lowes or Home Depot.